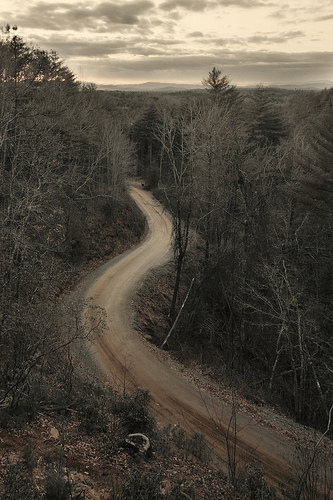 Years ago as my grandparents were driving through the mountains of North Georgia, my grandfather at the wheel and my grandmother at his side, my grandfather made a series of wrong turns before he realized he was lost. After trying several different routes he was not only unable to determine where they were headed, but he was eventually unable to get back to where they had been. The recognition that being together means never being lost is a profound truth. It was a characteristic of their marriage of over sixty years. Location didn’t matter. Time didn’t matter. Being together, side by side, patient with each other, and knowing that those we travel with are far more important than when or how we reach our destination was what mattered. After making a few course corrections they eventually found their way back to familiar roads. Throughout the rest of their lives together they continued to travel across the back roads of Georgia with their children, grandchildren, and other family members, occasionally getting turned around but never lost. Their travels are a metaphor for their life together. Are we truly lost when those who matter to us most are close by? My grandmother didn’t think so. Her nine little words, “As long as I’m with you I’m not lost”, speak volumes. They are also a reminder that kind words, spoken well, can last forever. This entry was posted in Atlanta, be, Behavior, believe, better, car, change, charity, children, communicate, create, Criticism, Dreams, Faith, Family, fear, Georgia, home, human contact, identity, Life, live, lost, love, maps, mountain, parents, road, share, social, Story Telling, talk, time, unity, wait. Bookmark the permalink.